Our luxuriously, soft School Memories Personalized Premium Sherpa Blanket is wonderfully constructed of a silken faux micro mink front accompanied by a faux sheepskin Sherpa back side, making it a popular choice for rest and relaxation. You have to feel it to believe it! 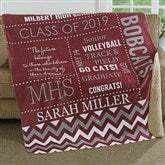 Choose any 2 school colors and we will custom personalize the blanket with their name, school name, class rank, year, and any sports or titles with special meanings! The quote, "The future belongs to those who believe in the beauty of their dreams" will automatically display on the blanket. Makes a great gift for any student, graduate, and athlete too!